From tracking your every breath, to getting frizzy hair when it's hot - physics is everywhere. But girls who take A-level physics only account for 21.5% of entries in Wales, according to Stats Wales. A new Physics Mentoring Programme aims to increase the subject's take up at A-level, particularly among girls. Students from five Welsh universities will be mentoring hundreds of pupils studying GCSE physics across Wales. Aberystwyth University physicist Carys Huntly said she had come across misunderstandings about who studies physics and what it is about. "It is interested in the smallest particle to the whole universe," she said. Before becoming a PhD student, a science outreach associate or studying physics at A-level, Swansea-born Carys said she thought physics was just "trains and cars". But after she studied it at A-level, she said learning the ins and outs of how everything works helped her creatively. "There's a perception that you have to be a certain type of person to do this subject, but it doesn't matter," the 26-year-old said. "Young people think science is miles away from what they do and enjoy everyday - but it's there at the gym, in your smart phone or clothes." Black holes aside, Carys Huntley explains where can we find physics in everyday life. Can we get lost anymore? It depends what you're near, or if you've got traceable technology with you. Wherever you are standing on Earth, you are in range of at least four satellites at a time - if you've got your mobile phone with you. There are 24 GPS satellites that orbit 20,000km (12,427 miles) above the Earth's surface that your phone communicates with to locate you. The signals give a very accurate picture of where you are and these co-ordinates can be sent to others. Why aren't more women in science jobs? Image caption Is it hot i(o)n here? What makes my hair stand on end? Have you ever noticed that your hair is far more prone to static electricity when on holiday in a hot, dry place? In dry climates the humidity in the air is much lower, which means that there isn't enough water in the air to conduct electric charge away. All things are made out of atoms. When there are an equal number of protons and electrons (the particles whizzing around the outside of an atom - its shell) the atom is neutral. If this balance is thrown out by electrons being attracted elsewhere then your hair takes on a very slight positive charge. This leaves the strands of your hair slightly charged and repelling each other similar to very small magnets. Can we see physics in sport? Getting your head around how every action has an opposite reaction is like the saying "what goes around comes around". We can see this when ice-skaters push backwards to propel themselves forwards over the ice. But in jumps they use their legs and arms to counterbalance the forces on their bodies - to stay in the air for longer. This is Newton's third law in action. Physics? Completed it mate. Lille Borresen, a physics student at Cardiff University who is one of the scheme mentors, said: "There's this preconception of what people think a scientist is, and it's nearly always a guy in a white lab coat with safety goggles - it's not the reality of it." Lille added that there is a big focus not only on showing pupils that science is cool, but also on the world of opportunity physics can open for anyone who studies the subject. 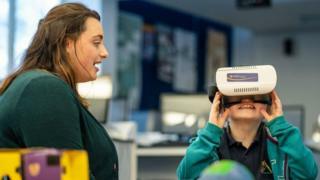 And Dr Sarah Roberts, who coordinates the mentoring programme at Swansea University, said: "A lot of students and their parents don't actually see the benefits necessarily of a physics degree. "But there's a wide variety of career options out there, so having someone coming in and talking about what they've been doing and what their peers are doing and what they've gone on to do after university can only be a good thing."